Let England Shake was probably my most anticipated album ever when it was released in February 2011. But when I heard it was an album about war, I was scared, because my experience with anti-war media has often been negative. Too frequently, it has this obvious “stop the fighting maaaaaannnnnn” tone, and the only emotion it creates is embarrassment on behalf of the artist, who had the audacity to think their whimpery songs could actually make a real difference in how people view international relations. In retrospect, I should have had more faith in PJ Harvey, who is my favorite artist in large part because she never takes the obvious, easy route. 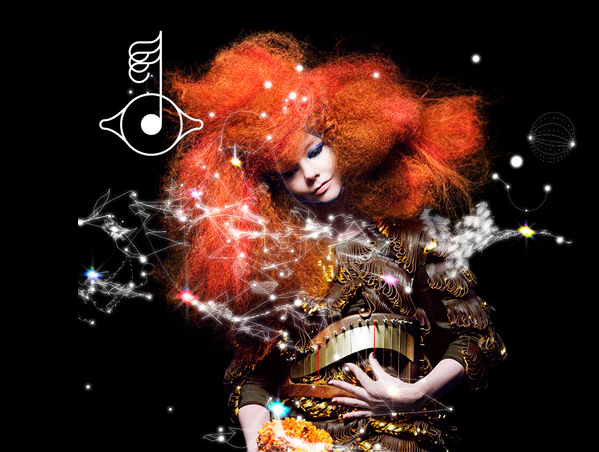 On her solo albums, she has constantly done the unexpected, adopting new personas and sounds so that each album she makes is a very pure, stand-alone vision. 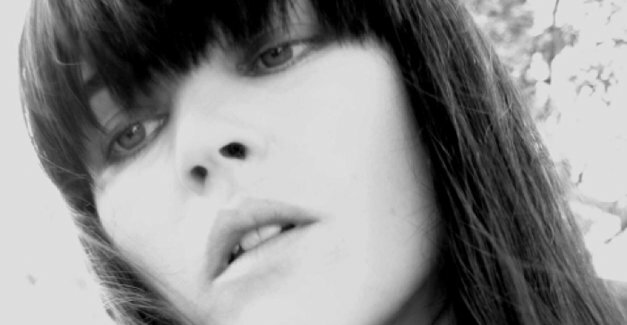 Her last album before Let England Shake was White Chalk, a haunting, piano-driven album that shared literally no resemblance to any of her previous music and confounded many of her fans. I figured if any artist could handle the subject of war, it would be her, but it was hard to imagine someone doing justice to the topic within the confines of a 40-minute album. On first listen, Let England Shake could be mistaken for one of those embarrassing anti-war albums. The lyrics that jump out are the violent or polemic ones, like on “The Glorious Land” when she says “what is the glorious fruit of our land?/the fruit is deformed children” while out-of-place war trumpets play in the background, or when soldiers fall “like lumps of meat” in “The Words That Maketh Murder.” Certainly, in some respects, Let England Shake fits the mold of conventional war art, with the horrifying “war is hell” imagery and generally defiant stance. But the more I’ve listened to this album over the last few years and thought about it, the more I’ve realized that it is so much deeper than it may first appear — anyone who writes it off as a shrill political album is not giving PJ Harvey enough credit and is misconstruing her intentions. Let England Shake is primarily concerned with history and place. It is about how the past is always with us, even if we weren’t there to see it ourselves, and how a nation’s previous decisions can continue to haunt those who are still living there today. These themes are there in the lyrics, but are also cleverly present in the music itself, in particular through the use of sampling — “The Words That Maketh Murder” borrows the lyrics “I’m gonna take my problem to the United Nations” from Eddie Cochrane’s “Summertime Blues,” while “Written on the Forehead” samples “Blood and Fire” by Niney the Observer. These samples create an effect where ghosts from the history of music are present in her songs, mirroring the album’s stories of past wars and fallen soldiers that are still, in a sense, with us today. Harvey plays an interesting role on Let England Shake, as a woman describing the theater of war, which has historically been created and populated by men. Singing in her upper register, similar to White Chalk, she mostly acts as a narrator, describing the atrocities she sees in vivid detail — in my mind, I imagine her floating around the battlefield like a ghost. The lyrics often seem inspired by World War I poets like Siegfried Sassoon, or other classic poems from Britain’s past (the story of “All and Everyone” is reminiscent of “The Charge of the Light Brigade”), and they have the same power as the stories from people who lived these wars. But while Let England Shake is heavily steeped in the past, it never forgets to relate it to the present, and it asks real questions about how people have to live with their nation’s histories. These themes come through most clearly on “England,” where Harvey drops her role of narrator and sings directly from the current-day first-person perspective. This is obviously the song where the album’s sense of place is most apparent, and it captures this very specific, ambivalent feeling that is also common among Americans. I often feel a connection to my country and sometimes even a level of pride in it, but it is so frequently matched by disgust for the things done in America’s name, either presently or in the past. So much of Let England Shake is about this uncertain attachment, and it’s part of why I think it goes beyond just being an anti-war album: while it is criticizing moments in England’s past, it is coming from a place of deep love and connection, which is what “England” really articulates. It’s the song that really ties together the album’s themes and helps push it beyond being a stodgy history lesson. A theme I’ve found to be present in nearly all of PJ Harvey’s work is the tension between ugliness and beauty. Her early music, in particular 1993’s Rid of Me, was self-consciously ugly and intended to shock, with abrasive production, noisy guitars, and the austere cover art showing her naked in a bathtub with her hair coiled like Medusa. 2000’s Stories from the City, Stories from the Sea was intentionally the opposite, an attempt to make a beautiful album with lush guitar reverb and actual love songs — music videos from the album like “Good Fortune” showed Harvey looking more glamorous, confidently strutting around New York City. Let England Shake is the synthesis of these two extremes: it has a graceful, beautiful folk sound, but the lyrics and themes are ugly, violent, and ambiguous, much in the way her early music was. This is why Let England Shake often feels to me like a culmination of all her previous work, and proof that while she sounds different, her music still hits incredibly hard. The same year Let England Shake came out, I ended up taking an English course in War literature. My final paper for the class was about Slaughterhouse-Five and used one of my favorite quotes from the novel: when Kurt Vonnegut says he is writing an anti-war novel, a filmmaker replies “Why don’t you write an anti-glacier book instead?” The strength of that book and Let England Shake is that they don’t fall into the trap of merely being anti-war and thus anti-glaciers. Instead, they study the impact it has on the people who lived it and those who came after. I try not to say albums are “literary” since they’re their own thing, but Let England Shake has a level of nuance and depth that is exceedingly rare in music, and it holds up even when compared to authentic war literature. I consider it to be the most impressive musical accomplishment of the last several years, and one that I think is legitimately important to listen to. In 2004, PJ Harvey released Uh Huh Her, the one album in her catalog that I don’t consider myself a fan of. It’s not a bad album, but its lo-fi guitar tunes felt like a retread coming from an artist who I’ve always loved because of how she defies expectations. While some always wish that PJ would keep making music that has a certain sound, I think she’s at her best when experimenting and doing something that nobody expects her to do. This is why I think 2007’s White Chalk is probably her most underrated, and possibly the album by her I respect the most. After being known early on for her aggressive bluesy guitar songs (and even being acclaimed earlier in the decade for the straight-forward rock of Stories from the City, Stories from the Sea), PJ chose to set down the guitar entirely, instead writing a set of songs for the piano — an instrument she admittedly barely knew how to play. She also traded in her deep roar of a voice, singing the songs on White Chalk in a high, ethereal voice that is at the very top of her range. The resulting sound is ghostly, eerie, creepy, but also beautiful. It creates a unique distillation of moods that only PJ Harvey ever seems to be able to conjure out of me. It blows my mind that the same artist who made this album also made Rid of Me, which topped my 90s list and was pure anarchy, chaos, and rage. On White Chalk, everything is extremely delicate, including PJ’s personality which has gone from larger than life (like on “50 ft Queenie”) to someone who seems unsure of herself at every turn. Meanwhile, Rid of Me‘s swaggering rock has been replaced by songs that rarely feature much more than the piano or a broken harp. White Chalk ends up pulling off something that very few modern albums do: it sounds completely unlike anything else that came before it. It is an incredibly self-contained work that manages to create its own little universe in the span of 34 minutes. PJ takes everything that makes her unique and identifiable as an artist and reduces all of it to the bare essentials. 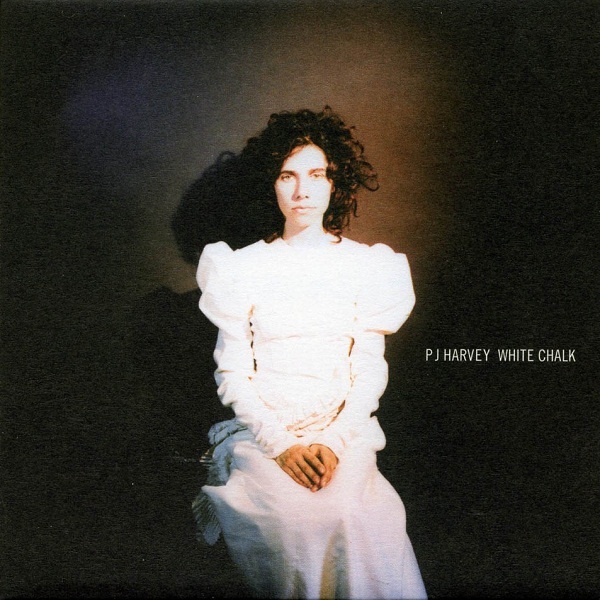 Despite the new sound and a completely different persona, White Chalk is still identifiable as a PJ Harvey album. The one constant in her work over the years has been her lyrics, and on White Chalk they hit harder than ever with the spare instrumentation. A recurring theme throughout the album seems to be childbirth or abortions: on “When Under Ether” she sings “something’s inside me/unborn and unblessed/disappears in the ether/one world to the next,” joined by an ominous, repeating piano line. The title track is one of my favorite songs by her, a lovely meditation on her homeland of Dorset that also references an unborn child at the end. Most of White Chalk is about a feeling of being solitary and lonely, but it’s also a more hopeful album than some give it credit for. “Before Departure” sounds like a funeral song of sorts, but I think it’s more about a choice to live a simpler life. 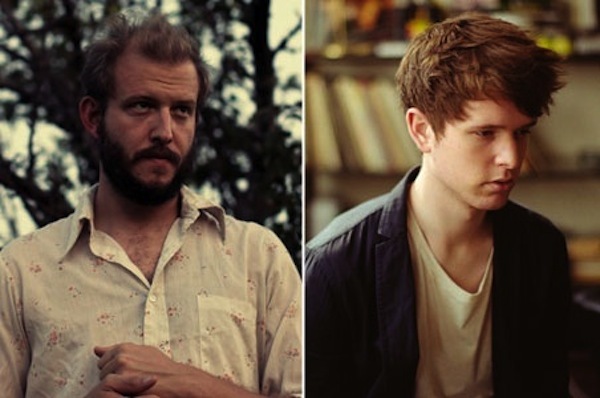 “Silence” has similar themes, with PJ singing “I freed myself and remained alone.” Of course, there’s plenty of darker material on the album too, which is par for the course for PJ. While critics usually lap up anything that PJ throws their way, the response to White Chalk was more muted, understandably so. It’s an extremely hard album to pin down from an artist who is the same way. It’s also not the type of album that ever makes these silly end-of-decade lists — it was perhaps self-contained to a fault, containing little in the way of broader statements about modern culture or life. With some patience, though, White Chalk proves itself to be maybe the most daring album in PJ’s catalog, an album that is completely unlike anything else and reveals its greatness slowly, in a different way than its predecessors.